Ever wonder where the name for the Virginia Building at 111 S. Ninth Street came from? You could be faulted for thinking it came from someone longing for that Eastern seaboard state — but you’d be wrong. 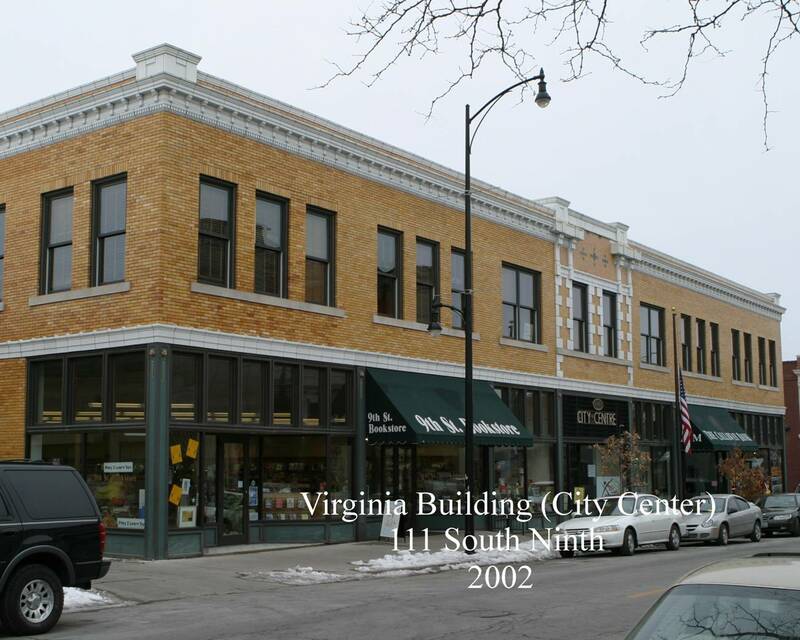 The Virginia Building was built in 1911 and named in 2002 to both the National Register of Historic Places and the Columbia Historic Preservation Commission’s Notable Properties List. The name of the building, however, could have just as reasonably been the Columbia Commerce Club Building — or later the Montgomery Ward Building. The name comes, in fact, from the name of the daughter of one of the investors who developed this formerly residential site into a commercial building. The investors were “Sanford Conley Hunt, Sanford F. Conley, J. Alex Hudson, and T.C. Hall,” according to the NRHP nomination. Hunt’s daughter was Mrs. Virginia Robinson and the building was named after her. Hunt and his family owned the building into the 1960s, notes the NRHP document. But why could the name of the building just as easily have been the Commercial Club Building? During the 1900s, Commerical Clubs and Chambers of Commerce were sprouting up throughout the nation. Three of the original building investors were founding members of the Columbia Commerical Club. The club, formed in 1906, changing its name to the Columbia Chamber of Commerce in 1927, was credited with “advancing commercial and civic interests in Columbia,” such as paved streets, electric lighting in downtown Columbia, the construction of the municipal water and light plant and the new county courthouse. The club, according to a Columbia Missourian article in 1918, was also responsible for ensuring the then new cross-state highway came through Columbia, following the Old Trails Road. Today, that highway today is Interstate 70. “Other notable Club achievements in the first decades of the 20th century included getting downtown railroad stations built for the MKT and Wabash Railroads, and promoting the construction of a new county courthouse and a large new downtown hotel… The hotel, which opened in 1917 as the Daniel Boone Tavern, remained in operation until the 1970s, and the building is now the headquarters for the City of Columbia,” notes the NRHP nomination form. The Club also rented space in the building for years. Yet, the building could have had its name changed to the Montgomery Ward Building. In 1928, Montgomery Ward opens one of its first retail stores — and the first in Missouri — in the Virginia Building. The first Wards store opened in 1926 in Kansas, the document states. The company had been conducting a thriving mail order business 1972. Ward has been credited with starting the mail 0rder catalog business. Such businesses were popular with rural residents who could not travel to urban areas to shop. But by the 1920s, improved roads and automobiles were making rural shoppers more mobile, threatening the mail order business. Eventually, the Ward company developed plans for retail store fronts. “The Wards store was one of the most prominent downtown department stores ever to operate in Columbia,” according to the NRHP document. However, in 1961, the Wards store moved to a new location. Even prior to this, the then owner, Hunt’s daughter Mary Francis Hunt, had been looking for a new tenant and declined an offer from Macy’s in Kansas City. In the 1960s, Strollway Investors remodeled the building, basically slipcovering it with a metal covering to make it look more modern. In 2000-2001, the building was remodeled and today, it looks much like it did when the Columbia Commerce Club held meetings there. And we all know it as the Virginia Building.